According to Ekso Bionics, each year as many as 500,000 individuals experience a spinal cord injury and 15 million others suffer a stroke. So when I saw a trailer of the Avengers with Iron Man, I thought it would be exciting if a wearable device could help persons with disabilities gain their mobility and independence. Ekso Bionics is developing wearable devices to help the recovery process within a clinical setting. EksoGT is a robotic wearable exoskeleton, which is an FDA approved product for individuals with hemiplegia due to stroke. Over 200 clinical centers worldwide use EKsoGT for their patients during their rehabilitation treatments. Ekso Bionics clinical studies indicate that their EksoGT gait training rehabilitation for stroke victims improves their functional mobility and may improve walking without the device. In addition, Ekso Bionics developed eksoZeroG and eksoVest, which help productivity for construction workers and reduce their fatigue in the work environment. Deaf or hard-of-hearing persons have challenges in communicating with others in their daily life. Especially in a group conversation settings such as meetings or social gatherings with friends and family, it is difficult for them to participate in conversations. If your closest friends, coworkers, and relatives are open to trying a solution for deaf or hard-of-hearing persons, an app called “AVA” will help to increase their involvement and encourage their interactions. Expanding and encouraging to create an environment to include deaf and hard-of-hearing persons in social, work, and school settings is essential. Ava offers two plans. You can join Ava conversations for a free or a paid plan. The free plan allows 1 or more friends to use for up to 5 hours per month. The other plan is real-time captioning with 1 or more friends, with no monthly limit for $29.99/mo. Ava can understand and transcribe 12 spoken languages: English, French, Dutch, Spanish, Portuguese, Russian, Arabic, Thai, Chinese, German, Italian, and Norwegian. To use Ava, you need to install the app on your smartphone (i.e. iPhone/Android) and will need to create an account and allow access to your camera on your phone. You can use the app on one-on-one conversation on your phone or you can use it in a group setting. In a group setting, it is best to ask others to install on their smartphones. Within the app, use the option of sending “invite” from your contacts. Then a written text will be sent to the person with instructions of how to install AVA app. Or if you are in the same room and would like to speed up to add people, you can use the QR code button on top-right and share the QR code to each person. Next time you can just tap “green Connect” to include the person in the conversation. Some users reported that the accuracy is not 100% and depends on how you use the app. For example, the distance of about a foot from the speaker is about 85-95% accuracy. The noise and the accent of the speaker and rapid speech may reduce this accuracy rate. Use of wired microphone may increase the accuracy. In addition, captions are normally displayed between 1-3 seconds after words are spoken; however, if you have a slow internet connection, you may experience a delay in captioning. The following are a YouTube video of this app, AVA, and its installation/configuration instructions. The Mount’n Mover is one of the products offered by BlueSky Designs Company, which have designed inventive accessible solutions for making the impossible, possible, since 1997. Many wheelchairs users with their limited mobility face challenges in their daily activities even when they are at home. Many tasks such as eating, accessing computers, and reading can be a challenge. The Mount’n Mover mounting systems offer flexible and accessible mounting solutions when your need to attach devices on trays on wheelchairs, tables, beds, or floor stands. The mounting systems have custom memory locks with multiple tilt angles with moving and rotating mechanisms. Quick release Plate allows you to attach different types of plates for table, phone, computer, speech devices (AAC) and EyeGaze systems. In addition, the mounting systems can be used not only on your wheelchair, but so you can quickly detach and transport it from the Wheelchair Mount, a bed floor stand, or TableClamp without any tools. OrCam MyEye 2.0 device is a smart camera about the size of a finger and a microphone attached to a pair of glasses. The device can read printed materials such as books menu, labels, and signs. When the user points a finger at text, the device activates the text-recognition technology and reads aloud what’s in front of the camera. In addition, OrCam can read digital text on computers, smartphones and has money, color, and face recognition features. MyEye 2 can store up to 100 faces such as your friends, family and co-workers and can also store up to 150 of items of your choice. I posted a blog about OrCam in 2016 as a prototype among Smart glasses, but as of last year, 2017, it has reported approximately 5,000 users around the world. According to feedback from some users, the intonation or emphasis of the voice from the OrCam is awkward and has very little rhythm so it may not be comfortable for listening over a long period of time. However, others state that the device helps them be more independent in daily tasks and improves family interactions such as reading a bedtime story for their children. One mother used OrCam to read the page and then said it aloud to her children (2017, The Guardian). Unfortunately the prices are still too high (i.e. $3500 – $4500) for many people. Here is more information about OrCam MyEye 2.0. Typical standard manual wheelchairs have large rear wheels with an extended rim called the hand-rims allowing the user to self-propel. However, it is difficult to push on unpaved roads or grassy fields. MIT R&D and their students started the initial concept for the GRIT Freedom chair in 2008. They have tested their designs in toughest conditions in East Africa, rural Nepal, and Haiti. GRIT Freedom chair, all-terrain wheelchair have made possible for wheelchair users to go off road like a mountain bike allowing to use on grass, sand, and rough terrain. GRIT wheelchair (All-terrain wheelchair) uses lever drives which make it easier to push the chair forward than standard wheelchairs and stop without grabbing slippery hand-rims. 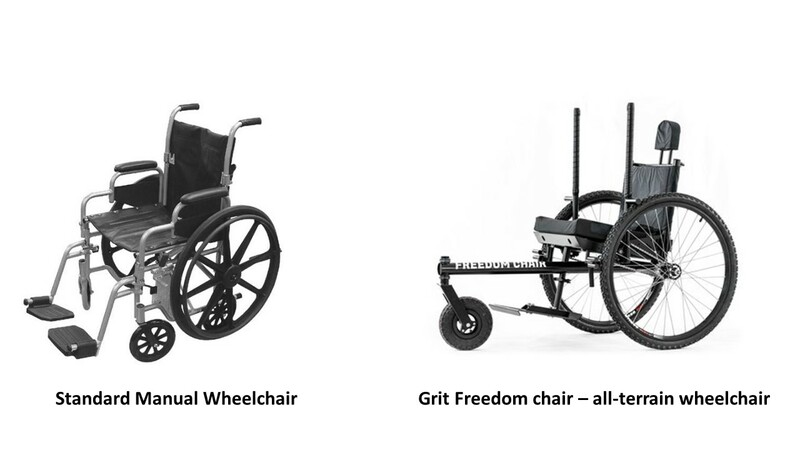 The following are the pictures of a standard wheelchair and the GRIT Freedom chair. This picture of this GRIT Freedom chair shows two hand levers but these are detachable depending upon the environment and the type of roads you travel. It is portable and can be fit in the trunk. The heaviest part to lift into a car weighs 25 pounds. In addition, the GRIT Freedom Chair uses an off-the-shelf bike drive so most local bike shops can repair. You can find more about GRIT Freedom chair (all-terrain wheelchair) product information at this link. https://www.gogrit.us. Persons who have difficulties with using regular utensils such as a fork and spoon because of their health conditions related to Parkinson disease, cerebral palsy, spinal cord injury, Huntington’s disease, or post-stroke deficits, may benefit from using Liftware utensils. Liftware offers devices which can help a person hold utensils and eat more easily. They offer two different products for meeting the individual’s conditions and needs. Liftware Level is a device which is suitable for persons with limited hand and arm mobility. By using Liftware level, they can keep their eating utensil level at the angle needed in spite of how their hand or arm turns, bends, or moves. Liftware steady, which is an electronic stabilizing handle with a utensil such as a spoon, fork, and spork. The device works great for persons who have tremor due to Parkinson’s disease to help them eat more easily. It stated that the handle of the device has a small onboard computer that directs and distinguishes unwanted tremor movement vs. the intended movement of the hand. The computer directs two motors in the handle to move the utensil attachment in the opposite direction of any detected tremor so that the user can control the utensil while eating. As a result, Liftware products seem to offer more stability and controls compared to low-tech weighted utensils so that it makes mealtime easier for persons who suffer from tremors and shakes in their hands or have trouble stabilizing silverware. However, the price (approx. $195) is expensive so hopefully those that need this device can get their insurance company to help cover the cost. For example, the following information is taken from the Parkinson’s Foundation (www.parkinson.org): The Parkinson’s Foundation is part of the Liftware donation program for people who cannot otherwise afford the device. If you think you could benefit from the device, call the Parkinson’s Foundation Helpline at 1-800-4PD-INFO (473-4636) to talk to one of our PD Information Specialists about whether the device is right for you. 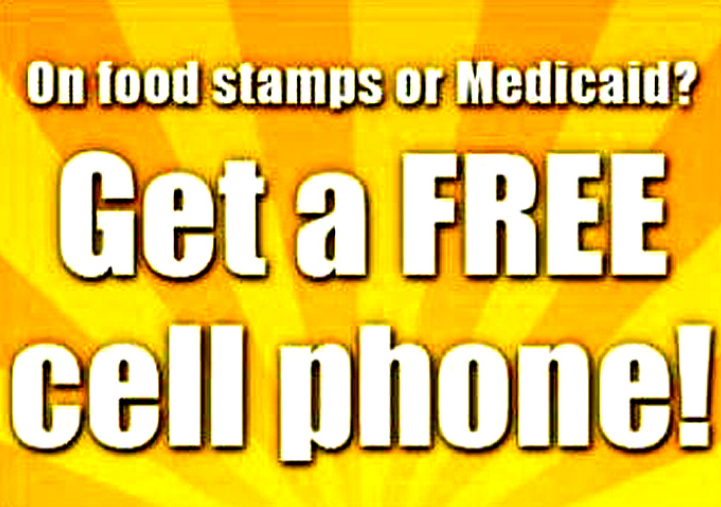 Individuals who cannot afford to get a cellphone because of their financial situation may be eligible to receive free mobile phones and free service through part of a free government-funded program. The eligibility guidelines differ from state to state. However, if you participate in any of the following public assistance programs, you could be automatically be qualified. To apply or find out your eligibility in the state you reside, you can go through application process online or you can visit assigned local locations in each state. Most online application process will direct you to the information by entering your ZIP code online. Persons with vision loss face challenging situations daily, especially when they need to travel, do certain tasks by following instructions or getting information for themselves. They may find this product and service called Aira to be very helpful. Aira consists of smart glasses with a camera which is connected to the user’s smartphone. Then a remote, trained vision interpreter assists persons with visual impairments. A vision interpreter can get instant feedback from the camera and describe whatever is in front of the user or provide detailed information such as instruction manuals for the user. However, Aira is not designed to make decisions. For example, when a blind person reaches at a traffic intersection, Aira can provide the user with the information on if the traffic light is green and no cars are coming, but it is up for the user to make a decision of when to cross the road. We often find it is difficult to offer additional support on how to use assistive technology devices after providing a technology solution. This is one technology product combined with service developed for persons with special needs. They offer subscription services with a 3-month intro price starting from $89 for 200 min and higher. More information and pricing can be found at: https://aira.io/plans. About Aira Visual interpreter: Click here. 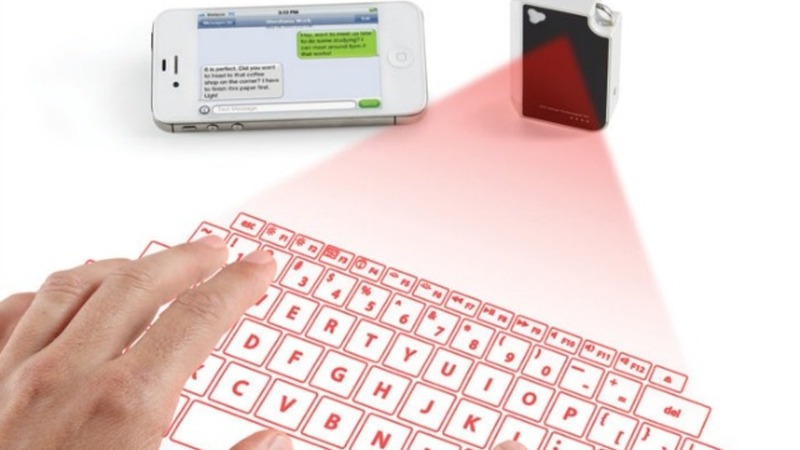 A virtual laser keyboard can connect to your mobile, tablets, or PC and projects an image of a virtual keyboard onto a flat surface such as a desk or a table. Then you can type on the projected keyboard surface area rather than pressing physical keys. The device detects the keyboard movements, determine the pressed keystrokes, and translates it to text. You can connect to your smartphone, tablets, or laptop by USB cable or Bluetooth wireless technology. Most devices come with a setting for virtual mouse. A virtual keyboard (or mouse) can be useful when you do not have access to keyboard and may work for persons who have bigger fingers, poor vision or the slower typist. Virtual keyboards or virtual mice are an innovative idea that came out about four years ago. However, it still needs to overcome challenges of being used in variety of environments and being accepted by all types of users. Most users reported that virtual keyboard is not like your common keyboard, and it takes time to get used to it. Virtual keyboard requires solid and non-reflective surfaces for working projection and typing. It is portable to travel, but it is difficult to use it in a plane or train because most devices need to be placed in an upright position. It has delay when typing so if you are a fast typist, it may not capture your typing. If the environment has too bright, it may not return accurate results. You cannot turn off the feedback sound on some devices. Its stability and accuracy need improvement. The mouse feature requires a steady hand. You can find discounted virtual keyboards around $30 compared to the original prices of $200, which was the average cost a few years ago. If you decide to buy one, here are some options of virtual keyboards you can find today. Please note this list is from January 2017 so the list may have changed since then. If you have seniors in your family, it is important for you to ensure their safety every day. However, you may not be able to monitor their daily activities all the time. According to National Council of Aging, it is reported that one-fourth of Americans aged 65+ falls each year and every 11 seconds, an older adult is treated in the emergency room for a fall. A smart wearable device (or a belt) worn around the user’s waist may prevent a hip fracture from a fall. A few examples of this type of belts are Active Protective and Hip-Hope. A proprietary multi-sensor system detects impending collision with the ground. A belt deploys airbags over the hips, immediately prior to the impact. Both products seem to collect ongoing multi-sensor data sampling while wearing, the sensor motion technology can determine falls prior to the impact and activates the micro-airbag protection, and this garment can reduce the impact force. For more information, please go to the links below.